Sunrise above Kīlauea's lower East Rift Zone shows lava flow through a channel on Hawaii's Big Island Tuesday, July 17, 2018. Tourism to parts of the island has plummeted since the volcano began erupting in a residential neighborhood and burning down homes in May. Authorities on the Big Island want to set up a lava viewing site to help, but they're finding it difficult to do while keeping people safe. The risks posed by the volcano came into sharp focus this week when lava flowing into the ocean triggered an explosion that sent a hot rock the size of a basketball crashing through the roof of a tour boat. One woman broke her leg, while nearly two dozen others suffered minor burns and scrapes. Still, pressure is mounting from businesses on the Big Island, where Kilauea is a major draw. Tourism to parts of the island has plummeted since the volcano began erupting in a residential neighborhood and burning down homes in May. Downtown Pahoa, which is just a few miles from where the volcano is sending a river of molten rock into the ocean, has been hit particularly hard. The small, rural town serves as a gateway to Hawaii Volcanoes National Park, which is normally the state's most popular tourist attraction but has closed indefinitely because of dangers to staff and visitors. As recently as April, travelers could watch molten rock in the park's lava lake and hike to remote spots to see flowing lava. State Sen. Russell Ruderman said the county needs to urgently set up a lava viewing site to bring visitors back to town. 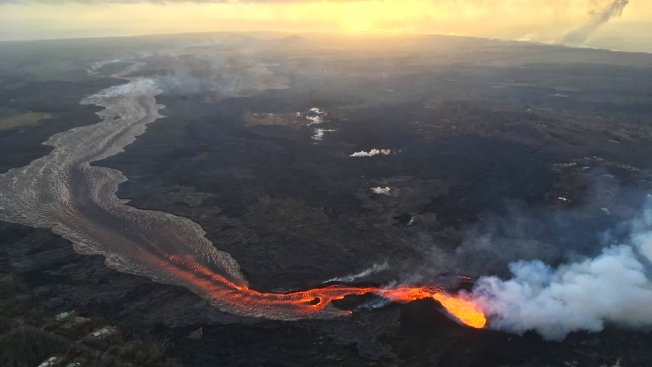 Currently, only helicopter and boat-tour passengers — paying about $250 each — are able to see the lava in person. Officials have cracked down on violators, issuing citations to more than 80 people for loitering in a restricted disaster area. The charge is a misdemeanor and carries penalties of up to a year in a jail and a $5,000 fine. 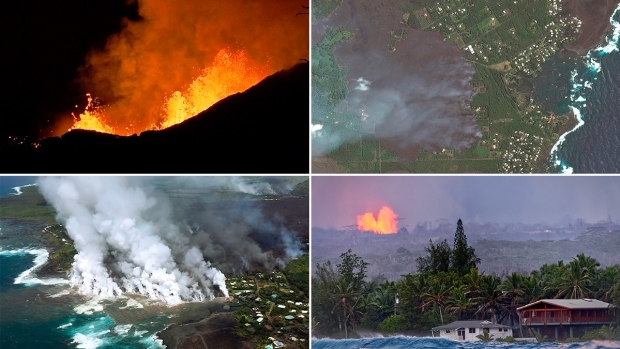 Kilauea, which has been erupting continuously for 35 years, has long attracted travelers. The Honolulu Advertiser newspaper reported 5,000 people a day descended on an official county lava viewing spot in May 1990 as molten rock slowly consumed the town of Kalapana. That's even though the spot offered views of cooled, not flowing, lava. County workers set aside some newly hardened rocks for tourists to touch as consolation. Ley noted Kilauea is behaving differently than in the past, when lava flowed from a different spot and through uninhabited land. 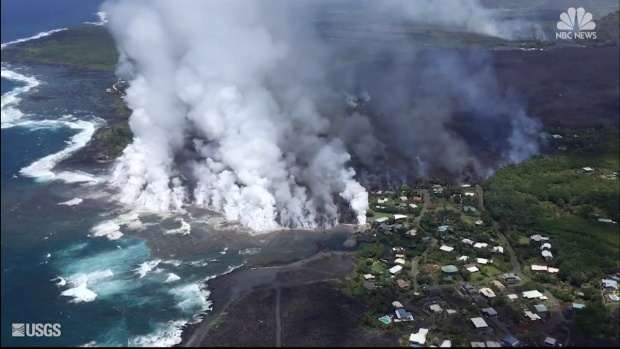 It also is producing more lava — erupting as much as 3,500 cubic feet (100 cubic meters) per second now compared with about 141 cubic feet (4 cubic meters) two years ago. She doesn't know when the county will be ready, but envisions a viewing site where tour buses could go and not private cars. The county may select several sites and open them as conditions allow, she said. "They've effectively cut my business' legs off. And there's nothing that can be done to save it unless they reopen the tourism industry, unless they stop criminalizing people for wanting to see lava," Tarson said. Restaurants and shops in Pahoa have lost 50 percent to 90 percent of their business, said Matthew Purvis, president of the Mainstreet Pahoa Association. This is partly because many residents have lost their homes and moved, but a significant chunk is because fewer tourists are visiting. The worst-hit are those that cater to travelers, like gift shops. Purvis' own place, the Tin Shack Bakery, has lost about half its business, he said. 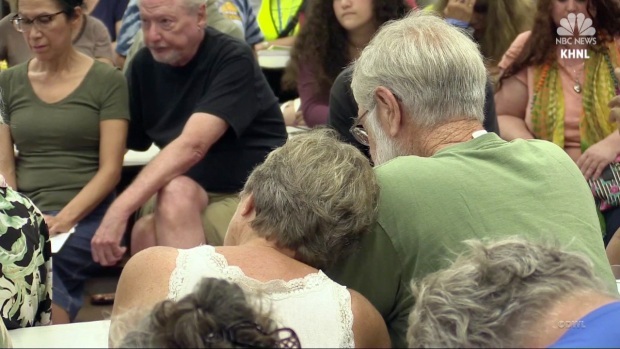 Hawaii County Councilwoman Eileen O'Hara said the county should contract several tour companies to operate shuttle buses from the center of Pahoa town to Leilani Estates, where lava is coming up through the ground. She said the bus could circle around to let passengers take photos but keep them inside, protected from any volcanic gases. State Rep. Joy San Buenaventura also advocates using shuttle buses to take tourists to a lava viewing site, but she said people should be able to disembark to see the lava. Visitors would be equipped with air filtration masks, she said.